Want more Protein after your workout? Both protein and carbohydrate are necessary for optimal recovery. 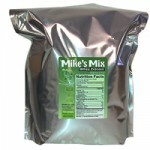 Add Mike’s Mix All-Natural Unflavored Whey Protein to any of our recovery drinks to increase your daily protein. Although the protein is unflavored it adds a pleasant creaminess to any of our recovery drinks. I think the addition tastes best with our chocolate flavors. Here are some suggestions for adding protein and the resulting ratios. Add ½ a scoop of Mike’s Mix protein to 2 scoops of our recovery drinks to achieve a 2:1 carbohydrate to protein ratio (50 grams of carbohydrate, 24 grams of protein). This ratio would be most beneficial for the athlete whose main goal is increasing strength, muscle mass and are engaged in high-intensity workouts. Add 1 scoop of Mike’s Mix protein to 1 scoop of our recovery drinks to achieve a 1:1 carbohydrate to protein ratio (25 grams of carbohydrate, 29 grams of protein). This ratio is suggested for athletes whose main goal is maximizing muscle mass, limiting body fat and are engaged in body-building type workouts.